Publisher’s Note: This classic Sobran column was written eight years before the fall of the Berlin Wall. The National Review Years, September 4, 1981 — Two decades ago the Berlin Wall went up nearly overnight, the most brutally unequivocal symbol of the division between our awed civilization and the clumsy barbarism that threatens it. In August the occasion was commemorated by two major American publications. The Berlin Wall is the most brutally unequivocal symbol of the division between our awed civilization and the clumsy barbarism that threatens it. A 4,500-mile border of the Socialist Bloc, at every point of which soldiers stand ready to kill those who flee. With calm eloquence and perfect historical and moral perspective, Horne has said, in a paragraph, the essential truth about a subject the major media have contrived to evade ever since the mid-Sixties. It is almost startling to encounter such sanity in a popular magazine. Like many painful topics, the real mechanics of Communist oppression have been surrounded by taboo and euphemism. Rosse recalled with special affection Alfred Hitchcock, who, at a press conference, made light of the Wall — a bit of “irreverence” Rosse found “refreshing,” in contrast to the “solemnity” with which our diplomats and politicians treated the whole business. The armed border most vividly exemplified by the Wall means that the hundreds of millions of people within are quite simply slaves, property of the states that confine them. “Unique in history, the Iron Curtain is predicated on the need to keep subject peoples penned in. After a few early modifications and continued remodeling over the years, it has become a remarkably effective prison.” – Jed Horne writing in Life magazine, 1981. We have been endlessly reminded that with the death of the Washington Star, which ceased publication the weekend Rosse’s article appeared, the capital of the Free World has become a one - newspaper town. This became a cliché so fast that I didn’t give it much thought. Like many painful topics, the real mechanics of Communist oppression have been surrounded by taboo and euphemism. But it is sobering that the Free World’s capital’s single newspaper — one of the two or three leading newspapers in the nation, the one most of our federal officials read every morning — sees fit to mark the anniversary of the Berlin Wall with a flippant defense of the Wall. Rosse and the Post are no doubt entitled to attitudinize lightly about American of officialdom. But to turn this sort of urbaner-than-thou “irreverence” toward official rhetoric into a total derogation of the freedom of East Germans, penned inside a huge political prison — that’s different. That’s serious — no matter how bantering the tone, how glancing the apology for the men who keep the prison. Copyright © 2018 by the Fitzgerald Griffin Foundation. All rights reserved. This article by Joe Sobran was published originally in National Review magazine on September 4, 1981. 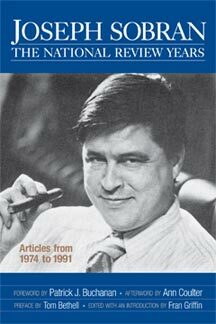 This is one of 34 articles in the Sobran anthology, Joseph Sobran: The National Review Years published by FGF Books in 2012. The book is currently out-of-stock, but the Fitzgerald Griffin Foundation hopes to reprint soon.